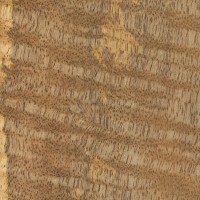 Color/Appearance: Because of the spalting that is commonly present, the wood can be a kaleidoscope of colors. Under normal circumstances, heartwood is a golden brown, while other colors such as yellow and streaks of pink and/or black can also occur. 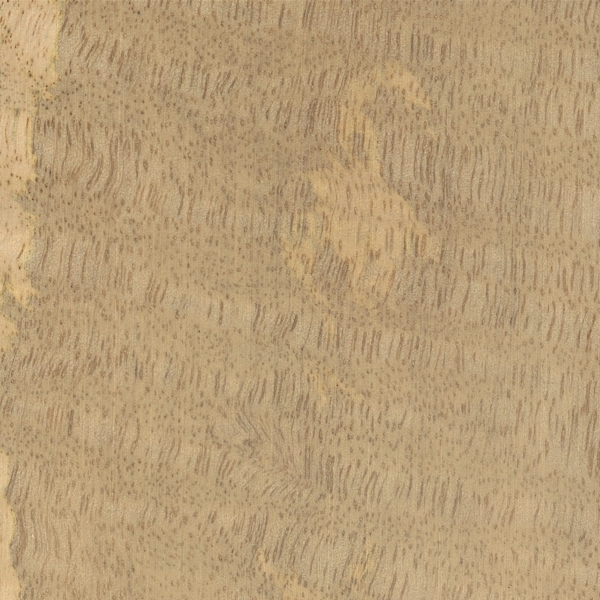 Paler sapwood is not always clearly defined. 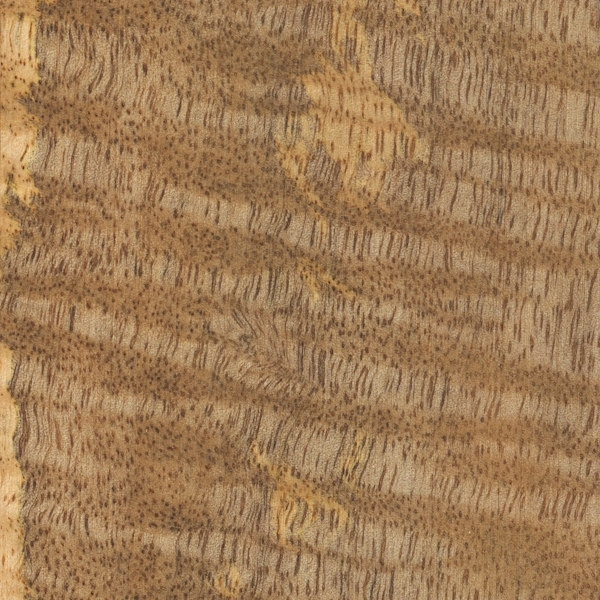 Curly or mottled grain patterns are also common. Grain/Texture: Grain can be straight or interlocked. With a medium to coarse texture and good natural luster. 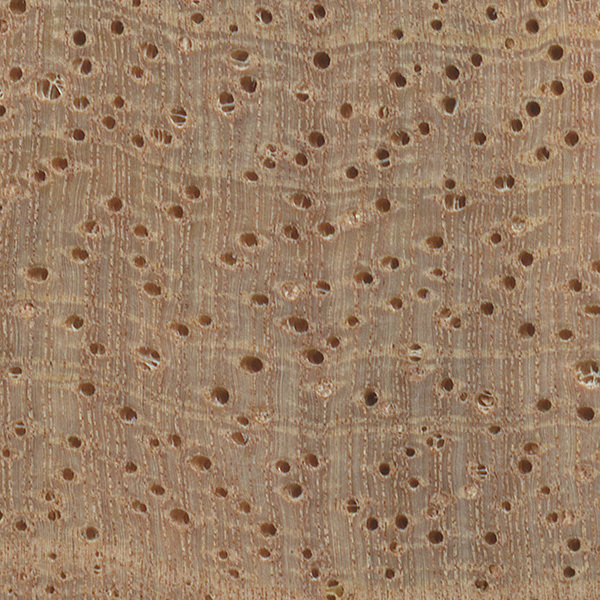 Endgrain: Diffuse-porous; large to very large pores in no specific arrangement; solitary and radial multiples of 2-3; tyloses and heartwood deposits occasionally present; growth rings may be distinct due to the presence of marginal parenchyma; narrow rays barely visible without lens, spacing normal to fairly close; parenchyma may be banded (marginal), paratracheal parenchyma vasicentric, aliform (lozenge), and confluent. Rot Resistance: Mango is rated anywhere from moderately durable to perishable. However, Mango is also susceptible to both fungal and insect attack. Workability: If interlocked or wild grain is present, tearout is common when machining. Reaction wood may also be present, which can shift as it is being sawed, potentially causing binding on the blade. Has a fairly high silica content, and will readily dull cutting edges. Glues and finishes well. Allergies/Toxicity: Although severe reactions are quite uncommon, Mango has been reported to cause skin irritation. See the articles Wood Allergies and Toxicity and Wood Dust Safety for more information. Pricing/Availability: Steady availability from specialty sources, usually from Hawaii, though Asian sources are also common. 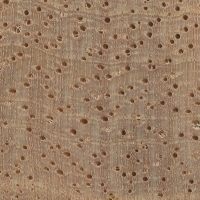 Mango is sold in board and slab form, as well as craft and instrument blanks. Prices for unfigured boards are in the moderate range for an imported lumber, and it is usually less expensive than Koa, another popular Hawaiian hardwood. Figured boards with curly figure, spalting, and/or vivid coloration are much more expensive. Sustainability: This wood species is not listed in the CITES Appendices, but is reported by the IUCN as being data deficient. It was formerly listed on the Red List as vulnerable. Common Uses: Furniture, ukuleles, veneer, plywood, turned objects, and flooring. Comments: Known much more widely for its fruit, Mango trees also yield beautiful and valuable lumber. The wood is considered very eco-friendly, as some Mango plantations harvest the trees for lumber after they have completed their useful fruit-bearing lifespan. Scans/Pictures: As you can see below, Mango gets considerably darker when a finish has been applied. 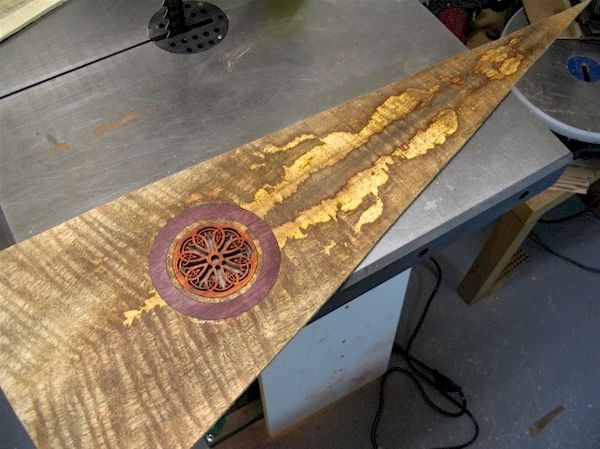 The piece below is an example of a curly, spalted piece of Mango. 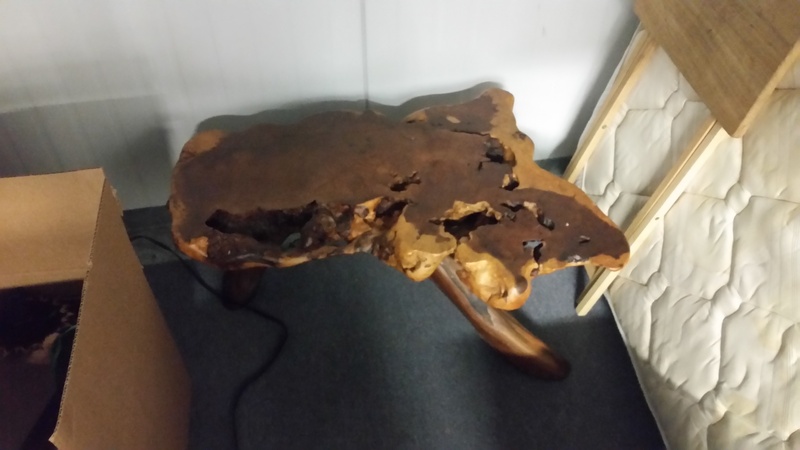 I recently bought a mango wood coffee table and I am looking to buy some more furniture. I want to mix the wood and I was wondering if you can recommend what wood would be good to mix with it. Is sun drying of mango wood for three month in subtropical condition (diameter 15-30 inches and length 40-45 inches) is accurate method. Or any other method to dry mango wood pieces of this dimension in large quantity. I have 3 x 20 x 100 cm manggo wood, already air dried and now average moisture content is 18% on top and 23% on bottom side. I’d like to start to use my conventional direct fire kiln dry chamber, it only has a firebox and pipe with blower to flow the heat from the firebox to the inside of chamber. With only temperature sensor and no humidity sensor. It also has only 2 standard fan, 1 fan to circulate the air inside and the other one to make air out when temperature gets too hot. Would you please share best drying schedule for this particular situation. I mean what temperature to start with, for how long, and so on and so on. 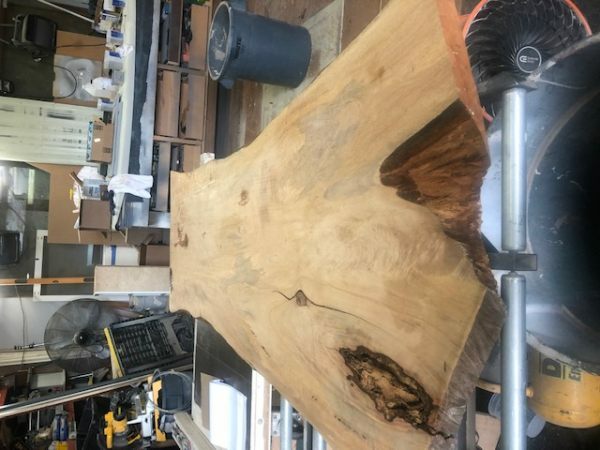 i recently purchased a 2″x 39″x 79″ kiln dried slab of mango to build an epoxy river dining room table , is there a way I can get the wood to gray in tone without stain? i saw a sample of mango and it grayed on its own and looked awesome! You can use a vinegar and steel wool solution, or leave it out in the sun for a while. My mango wood table is lighter than I’d like. Can I stain or use minwax to achieve a darker look. If so any directions would be helpful. You can stain it, but in order to get a proper and uniform stain, you’d have to strip and/or sand off the existing finish and ensure you get down to raw wood. After that, you would just follow directions on the product. I’d recommend sanding out a part on the underside of the table and testing the stain there first (or in another inconspicuous place) before diving into staining the entire top. I just purchased a mango dinning.g table and chairs. I would like to protect the table top with glass. Would this work,since I understand the wood needs to be polished with oil occasionally. Out of six original dinning room tall chairs and two replacements all made of Mango, six failed beyond repair from simple stress at the joints of the seat and the legs. All of this happened within three years of purchase of the original set. Not a happy camper over this. Will look for old furniture before I ever purchase new made of mango. Can you paint over mango wood furniture after it has had colour rubbed in? Want to paint with white satin. Is mango wood suitable for use as a cutting board – for food? Hi Nia, yes it is. You can season the board with several coats of vegetable oil to make it easier to clean. I have severa mango chopping boards from Scumble Goosie! I live in the Florida Keys and recently had to cut down a Mango tree on my property that unfortunately was growing above a drainage line. I saved the main trunk and would like to dry and season the wood but other than beginning by stripping off all the bark have no idea how to proceed. Any suggestions? Hi Patrick, your biggest problem is to keep termites and bugs away from your trunk. So, keep the trunk well of the ground and allow air to flow around it. Termites and bugs come as long as the wood is wet ( cellulose smell) so try to keep it under a roof or in a barn. Check it so now and then for termites and bugs. You can let the trunk dry for years that way if you have the time and patience for it. It can, however, build up tensions in the trunk which could be tricky when re-sawing. At some point you have to saw up the trunk in slabs, you can do that when it is freshly cut or after the trunk has dried for a longer time. I suggest you have slabs sawn of about 2 1/4″ thickness each. Drying time for 2″ thick slabs is about 2 years (1″ a year). Use sticks to separate the slabs and keep them straight. To avoid twist and bending I use strong truck winch straps every 3′ or so around the pile of slabs. It works great. Check them every 3 months and tidy them when needed. I’m using a lot of mango wood here in Thailand and get regularly trunks and trees from around my area. It is beautiful wood and very rewarding to work with. Generally lots of sanding (to avoid tear out on wild grain etc.) needed to get a nice result, but it’s worth it. 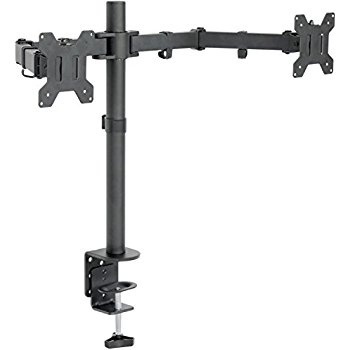 I recently got a mango wood desk, and was wondering if it was durable enough to hold a c-clamp dual monitor stand. 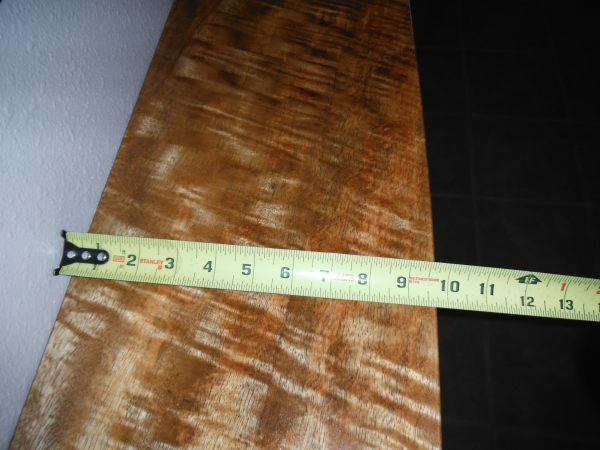 It would likely be holding about 30 pounds; the desk is about 1 1/2 to 2 inches thick. To Lynn. I am not a professional wood worker but do work with wood a lot. Generally, if there is a varnish, especially if it is a thick outdoor varnish, I would first use a a brush on stripper. Wear chemical resistant gloves or at least dish washer gloves (new, no holes). You don’t want to get it on your skin. Have a bucket of water beside you in case you do. Wear eye protection. Then use, or skip the stripper and start with 80 grit until you get to the natural color, then go to 120 or 150 then 250 grit. Because it will be a lot of sanding I would use a rotory sander until I was at the final stage with 250 which I would do by hand, with the grain. I would use no stain, and if it was going to be indoors I would use a water based varnish. For various woods I have used it on, it keeps the wood close to the original color where as oil based always makes it darker. It is also easier to apply, correct errors and much easier to clean up. Buy a good brush made specifically for water based varnish. My mango furniture is too dark. Can I sand it and stain light oak to lighten it? It’s possible, but potentially a LOT of elbow grease. Some people like refinishing furniture. For me, it’s almost as easy just to build the thing over from scratch! To each their own I guess. Crikey, build furniture. Am not that skilled, but changed my well made pine bedroom suite look like liked oak. As you say, a of of elbow grease, but successful. Maybe I will hire a sander. Can you recommend a product/oil/stain? Thanks for advice. If you sand it thoroughly down to raw wood, Mango should stain pretty well with most products. Just keep in mind that it doesn’t really have the same type of porous growth rings as oak, so you can’t quite compare color samples of the darker growth rings that oak might get when you compare stain colors. 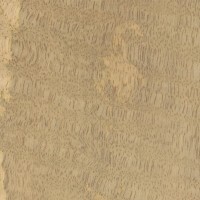 mango wood, true mango wood is light colored, never dark, ever. Mango wood is highly water-resistant and as such it’s good for outdoor wood projects. Is this wood one that can be used with food? Such as a salad bowl. The hard and dense mango wood is perfect for making kitchen accessories like chopping boards, serving trays, bowls, salad servers, etc. Is this wood hard enough to work well for book shelves holding lots of books? I’m looking at an expensive bookcase with mango shelves and I’m hoping they will not sag like the shelves I currently have. Is there a janka hardness number i should be looking for? Janka hardness won’t tell you much. You should be looking at Modulus of Elasticity (MOE). But beyond that, a lot will depend on how the actual shelves are made — i.e., if they are supported in the back, if they have reinforcement on the front edge, etc. Might have some issues while sanding, but finished furniture shouldn’t be a problem.